Tangy, crusty sourdough studded with hunks of Belgian dark chocolate, baked by the good people at Zingerman’s Bakehouse in Ann Arbor, MI. I can’t stop eating it. Buy one instead of flowers this Valentine’s Day! Even with shipping, the chocolate sourdough loaf is cheaper than a dozen roses. If you’re lucky, your Valentine will share it with you. 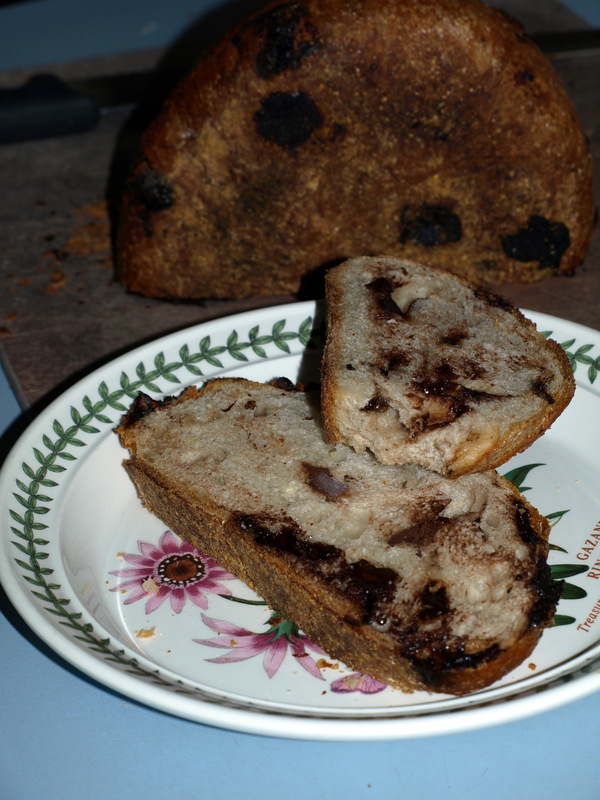 I believe Nancy Silverton was the first to develop the chocolate sourdough cherry bread recipe (you didn’t mention whether your loaf includes cherries). It became enormously popular in L.A. in the 90s. I once took a bread baking class from her, and she said she wished she had never created it because it tended to eclipse the other wonderful breads she developed. I am not much of a chocolate fan, but I adore and crave this bread, which we can’t get here in Arizona. Jamie saw your post and ordered a loaf for me from Zingerman’s. I’m looking forward to comparing it to my memories of the La Brea Bakery version. By the way, Nancy’s recipe is in her bread baking book, but I’ve never attempted to make it.